Our last two daughters moved out this past year making us official empty nesters. While I love all of my girls to pieces and it was hard to see them go, it is nice having the house to ourselves again. Another perk is being able to transform their rooms in our Bungalow 47 style. Yes!! The girls old rooms are your average size bedrooms so it’s easy to paint and revamp things without a major overhaul. I’m turning each one into a fun guest room and keeping them “at the ready” in case someone needs a room for a night… or two. Then I got busy… I picked up this small wash stand at an auction for $30.00. 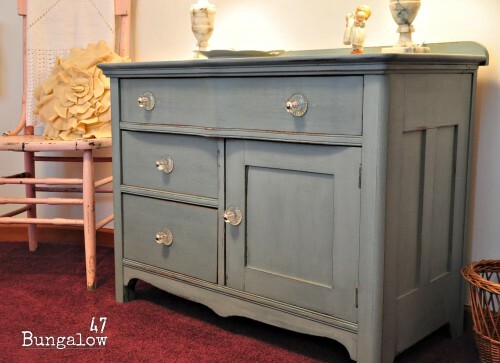 Transformed it with a little chalk and clay paint and adorned it with new knobs from Hobby Lobby. Then I accessorized it with a couple of alabaster lamps and a shabby chic china plate from an estate sale along with a knick knack from my Mom of a little girl holding two babies. She gave it to me when the twins were born. This added sentiment to the room. 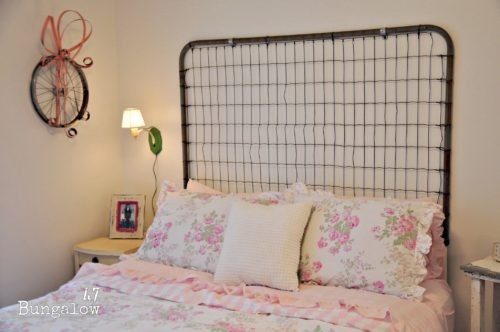 I had been hoarding this rusty gate for a while just waiting for a chance to use it as a headboard. 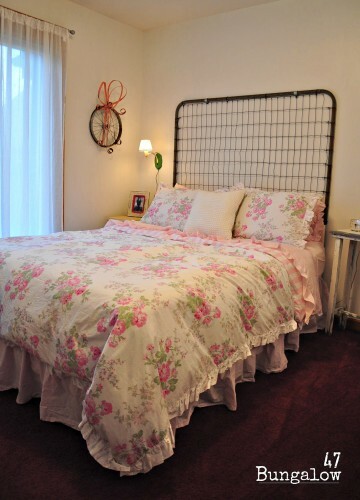 So once I came across a queen size bed frame I picked out some bedding from the Rachel Ashwell’s Simply Shabby Chic line at Target and voila, a B47 style bed. I was also fortunate to find this adorable vintage laundry cart at a flea market for $15.00. It is absolutely perfect for holding towels and toiletries exclusively set aside for our guests. Above the cart I hung some salvage trim with hooks, one for each guest. 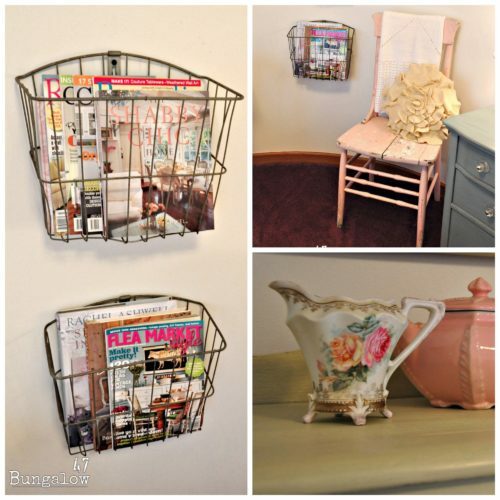 On the wall near the bed and next to a sweet chippy peely pink chair, I hung old bicycle baskets that I found at an estate sale for $3.00. 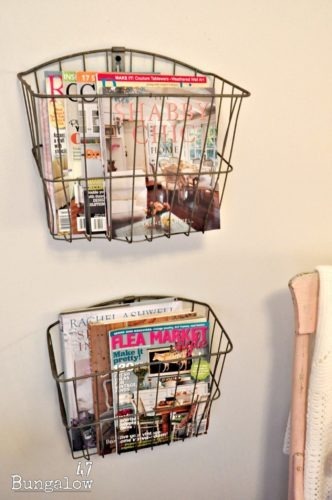 Just the right size for storing magazines and books. Fun inspiration for a late night read. This chippy peely pink chair came from a flea market for $10.00 and once again I added a pillow made from an old pale yellow angora sweater and a tiny receiving blanket crocheted by my Grandma for the little girl who grew up in this room. More sentiment. Lighting was also important to keep in mind. We put the main overhead light on a dimmer switch and added this sweet vintage night light on the wall. Handy for reading in bed. The alabaster lamps on the wash stand were also estate sale finds, they add a warm touch to the room. 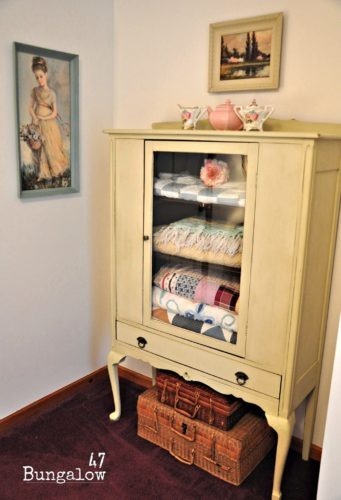 The last corner of the room was an ideal spot for this repurposed china hutch found at a flea market then painted in chalk/clay paint. Once again it makes a fun spot for a little more sentiment. Inside are quilts and afghans given to me over the years from Grandmas and Aunts. 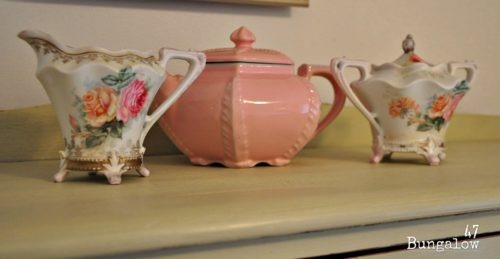 And the top is reserved for a few pieces from my Grandma’s china collection. So far we’ve only used this room a few times when our girls have popped back in for a bit, but it sure is nice to know that it’s there and at the ready. There is also one final secret I haven’t shared about this room yet. When I painted the walls I picked out paint from Home Depot and had them add some Scentco paint additive from Glade to it. It’s amazing!! I painted the room 6 months ago and it stills smells super springy and fresh. I highly recommend it!! P.S. 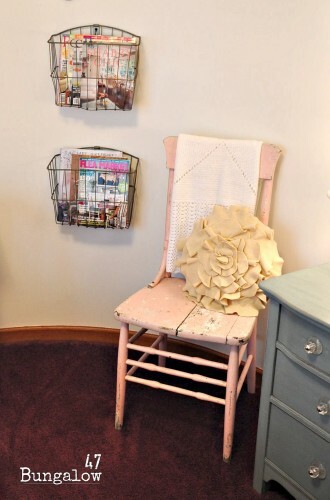 Check out week 5 of Jill’s inspiration posts for more tips about guest rooms. Love those alabaster lamps (which are barely peeking out in one picture) and that miniature wall sconce! Nice job. Isn’t it great to have the house all to yourself? LOVE THIS!!! 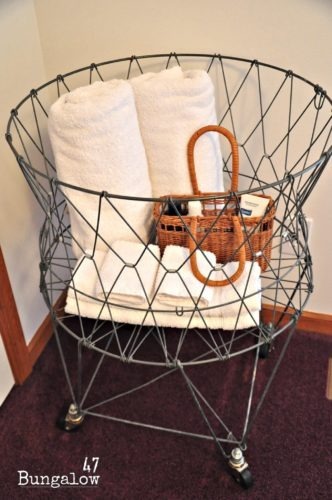 I’m in love with the vintage laundry cart! What a great room! 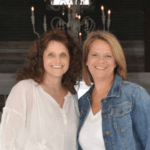 Thanks for entering over at our link party! So glad to have found you! Features will be announced on Sunday!!! XXXOOO! I hope you party with us again today!